We’re back again for Week 13 of the NFL season to identify some sleeper candidates who could find themselves more valuable in fantasy football sooner or later. Aaron Rodgers provided the sound bite to sum up the Packers’ disappointing season when he said that he “know[s] that football mortality catches up to everybody.” But if Yards Added is any indication, not all sleeper candidates are young. My rushing and receiving Yards Added metrics compare a skill player’s yardage totals on their plays relative to expected totals based on factors like the down and distance, distance from the end zone, quality of run-blocking, and quality of coverage. As such, they are perfect tools to identify players who could see a bump in future workload because of their efficiency. A few such players stand out as sleepers for Week 13 and beyond, headlined by a running back who is even older for his position than Rodgers is for his. Blount had by far his best individual performance of the season on Thanksgiving with 88 yards on 19 carries, but even that boost couldn’t push him past a still-dreadful 2.8 yards per carry this year. 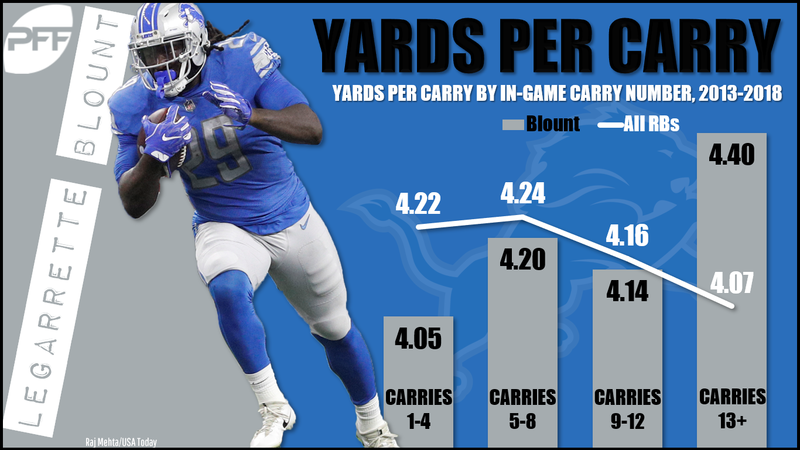 That rate makes it sound a bit worse than it is; Blount is used frequently in short-yardage situations with expected yardage totals in the 2- to 3-yard range, but he’s still cost the Lions 18 yards on the season and has been one of the least efficient backs in football. Nearly a decade into his career and at age 32, I had just assumed Blount hit the wall that so many backs have around that age. However, this week’s performance made me question that assumption. Blount added more yards this week than any back except for Saquon Barkley, and he did that against a Bears’ defense that has reduced its opponents’ yards per carry by about 5% relative to an average defense. Perhaps it was simply a good game, but I wonder whether his expanded workload in the wake of Kerryon Johnson’s knee sprain contributed. We’ve all heard the cliché that power backs get stronger as a game progresses, and that turns out to be very true for Blount. Since 2013, Blount has done his worst work with 4.05 yards per carry on his first four carries of games and his best work of 4.40 yards per carry once he’s picked up at least 12 carries. And though you might guess that those heavy-workload games were biased toward opponents who were particularly bad against the run, Blount’s trend runs counter to the overall trend of backs when they reach similar volumes. Blount really is the premiere clock killer. Blount’s personal history and performance in Week 12 makes me think he is a safe bet to use in games where he looks to be the featured early-down back. Last week, he yielded just four snaps to Zach Zenner, and Theo Riddick took his carries in situations where Blount has traditionally never carried the ball in any case. The Lions look committed to Blount for as long as Johnson is out, and that could pay dividends this Sunday against a Rams’ defense that boosts yards per attempt by 15%, the most of any team in football. Allen’s win against the Jaguars Sunday bumped him to a 3-3 record as a starter this season, but he still seems miles away from fantasy rosters. His draft-day detractors were most concerned with his throwing accuracy, and a 52.5% completion percentage this year is a strong supporting argument, albeit with a 10.1-yard average depth of target. I wouldn’t rely on him this year, either, but I have started to develop some optimism for his fantasy future. I see him as a more-extreme Mitchell Trubisky. 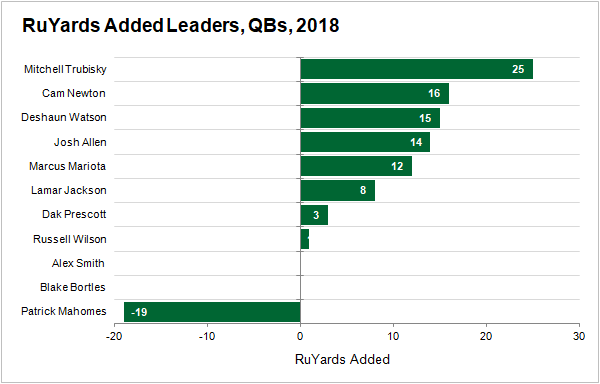 Trubisky failed to complete 60% of his passes as a rookie, but he has seen his rate spike by 6% this season in part because of an improved supporting cast. There is no telling what the Bills will do this offseason, but it’s clear they have the capacity to make major upgrades. The team’s wide receivers and tight ends have combined to cost the team 66 yards this year, fourth worst in football. Meanwhile, Allen, like Trubisky, can run. He has 14 Yards Added as a runner, which is similar in total and by rate to Deshaun Watson and Marcus Mariota. Moreover, Allen seems to be built to better withstand the punishment running quarterbacks take. At 237 pounds, he is among the biggest passers to take snaps this season. 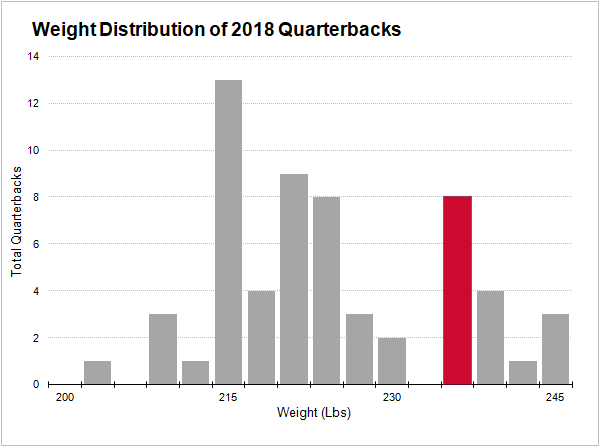 He has 15 pounds on Trubisky and close to double that on Lamar Jackson and Russell Wilson. Allen can top out around 60% passing and still thrive as a fantasy player if he can run for 600 yards and 10 touchdowns per season, which is the pace he is on this season. That makes him a compelling sleeper in dynasty leagues. Ekeler should be the top waiver option to target this week. Melvin Gordon sprained his MCL and is going to miss a few games, and Ekeler has been exceptional with 36 RuYards Added on just 70 carries and 20 RecYards Added on 36 catchable targets. The former is a similar efficiency rate as standout running backs like Saquon Barkley and Aaron Jones, and the latter is a similar efficiency rate to standout receiving backs like Todd Gurley and Duke Johnson. Workload is the only thing preventing Ekeler from becoming an RB1. That said, I think Jackson deserves a look, as well. He went for 57 yards on seven carries last week to help return him to a near-neutral -1 Yards Added on the season; he had just 7 yards on his first five carries back in Weeks 6 and 7. Jackson also looked explosive and could be the team’s choice to handle early downs even though he’s a similar size as Ekeler. All of Jackson’s carries this season have been on first or second down, and Ekeler thrives on passing downs. Really, either Ekeler or Jackson could develop into a three-down back in the future if they can withstand so heavy a workload at their size. But Jackson is the one who is still off of radars. Pick him up in your deeper formats. I’m not sure four catches for 77 yards and a touchdown qualifies as a breakout performance, but rookie 49ers receiver Pettis has bookmarked his midseason knee injury with enough low-volume but efficient performances to pique my interests. On the season, Pettis is up to 6 Yards Added on just 13 catchable targets. 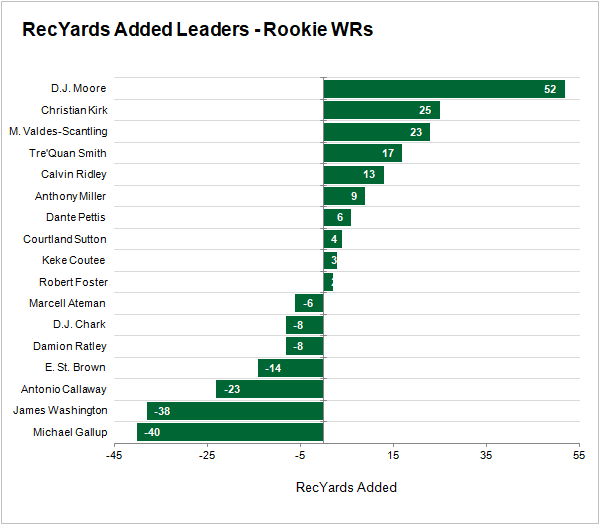 By rate, that is similar efficiency to fellow rookie Christian Kirk as well as Tyler Boyd and JuJu Smith-Schuster among non-rookie slot receivers. Based on Yards Added, the 2018 class is shaping up to be an all-timer for wide receivers. Ten of the 17 rookie wide receivers with 10 or more catchable targets have a positive Yards Added total this season. That may help you land Pettis in your keeper formats if other owners are judging him to the high standards of usable fantasy rookies like D.J. Moore, Calvin Ridley, and Marquez Valdes-Scantling. Don’t let their success color what looks to be a bright future for Pettis in San Francisco.